Sometimes I have these brilliant ideas that answer significant problems, only to discover the thing I invented already exists. I wrote a story about mall cops and then two (awful) movies about mall cops came out. I invented a tray that you could strap to yourself so you could walk up and down stairs carrying things and still have free hands, but then I remembered vendors use those trays at every sporting event ever. I also thought of a vending machine that grabs your drink for you so it doesn’t fizz when it falls down. That’s already a thing too, so… I may be an idiot. This next list is no different. Last Valentine’s Day, I wrote this impassioned manifesto to the potato but didn’t have anyone to enlighten. Someone suggested I turn it into a post instead of ranting about it all the time, so I did, laughing over my brilliance the whole time. I double checked ONE fact on Google and discovered there are a lot of people who think the exact same way. In fact, there’s a Facebook page dedicated to the subject. I could waste my time being sad that I’m not original in any way, but I’d rather rejoice because I’m not alone in the world. The point is, I’m sorry if you’ve heard it before. There’s nothing new under the sun (or, in my case, hiding in the shade, trying not to get burned). I don’t like flowers. They’re a metaphor for all my failed relationships. Someone spends a lot of money and then we get to sit and watch the thing wither and die, until one of us (me) throws it away because it’s ugly and making us sad. I got kind of nervous my face was going to stick this way. A real gift is one you give because you’ve considered what the recipient really loves. 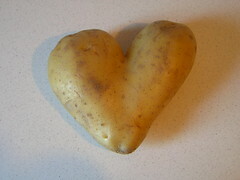 That’s why, for me, potatoes are the most romantic Valentine’s Day present. – I love potatoes in every incarnation. Mashed, scalloped, twice-baked, once-baked, soup. They’re very inclusive because they’re incredibly versatile. 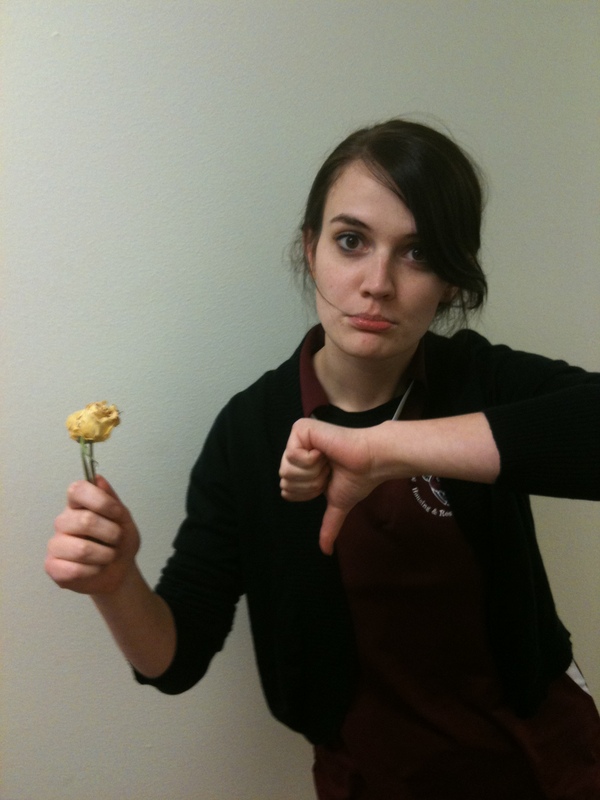 If you don’t like potatoes one way, you probably like them another way, and that’s cool. I don’t really like french fries but you might. You can eat fries and I’ll eat potato salad, and we both get what we want. Relationships are built on compromise. – Potatoes are a fine addition to any romantic dinner. Potatoes au Gratin, for example, look delicious in candlelight. Mixing flowers and candles sounds like a fragrant deathtrap waiting to happen. – On a related note, I would take the smell of a baked potato over a field of flowers any day. Especially days when I skip lunch. – Flowers mean bees and allergens, and were once used in a trap laid by the Wicked Witch of the West. You never hear about potato traps. – Potato guns are great for shooting your siblings. Flower guns sound lame. You know who would shoot a flower gun? (Bad pun alert ahead. Avert your eyes!) A pansy. – Potatoes are much hardier than flowers. You have to baby flowers, but you can throw a sack of potatoes in the darkest corner of your pantry and they’ll be fine. In fact, they’ll grow more potatoes. That’s amazing! 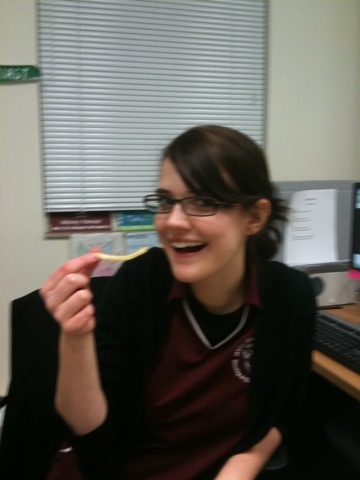 Is it weird that I had so many pictures of me enjoying potatoes that it was hard to choose one? – Potatoes can be a relationship metaphor, too. You worry that everything is just dirt, but you poke around a little and BLAMMO! Potato! It may not look like much, but it’s good for you, and could potentially become something pretty excellent. – Like the ideal significant other, you can hang out with potatoes all day and they still find ways to surprise you. In the morning, they’re hash browns. At lunch, they’re chips. At dinner, they’re baked potatoes that have been warming up for two hours and baby, they’re just getting started. You could take potatoes to a party and everyone would be happy to see them. You could take them home for Thanksgiving and your mom would like them. – Potatoes cross religious lines. Irish Catholics went through that whole potato famine, and Jewish people are big on latkes. – A bag of potatoes lasts forever. Flowers have maybe two weeks, but potatoes potentially have months! – If you’re looking for something to represent the electricity in your relationship, there’s nothing better than a potato battery. Have you ever seen flower power do anything to a light bulb? – When you’ve run out of potatoes, the burlap sack they came in easily converts to a stylish dress with a few well-placed holes. And that, ladies, is why you should consider marrying the dude who brings you a sack of taters this Valentine’s Day. Ok, last one. I was trying to point out how potatoes and the word “love” are often found together, but it’s really hard to look excited about a vegetable without also looking crazy. P.S. : If you want to read an article by yours truly about how love is imaginary, your wildest dreams could come true right here. Excellent post! Right in line with my Valentine’s Guide To Success! Which, incidentally, I enjoyed very much. Looks like you’ve really gotten to the root of what Valentine’s Day is all about. In all seriousness, I’m pretty sure Irish people give each other potatoes for most major holidays. That’s it. I’m moving to Ireland. I dig this article very much. ;) I love potatoes too. :) Deep down, don’t we all? Happy Valentine’s Day! Here’s a short list of potato diseases for you Stephanie: Black leg, sclerotinia and powdery scab. 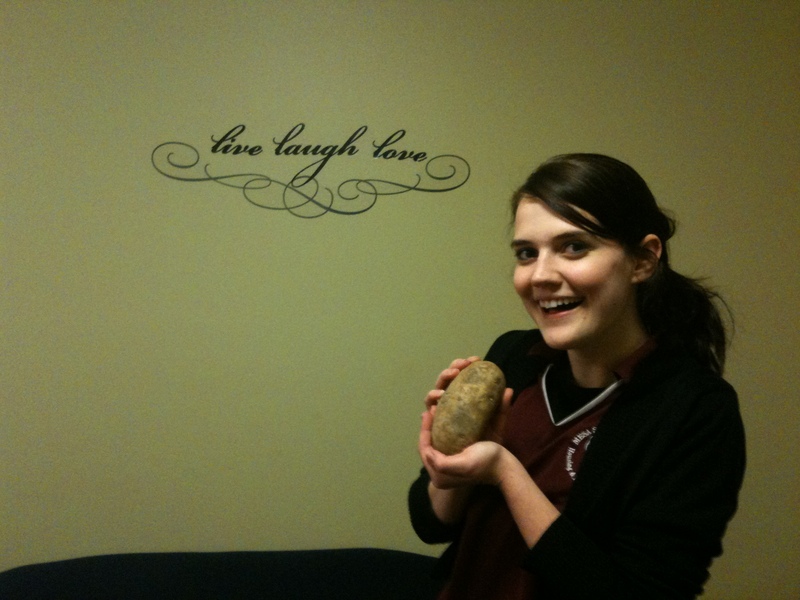 if you do get into a relationship symbolized by a potato, you might want check for these first. I’d hate to anything bad happen to a sweet potato like you. Ha. This is either the greatest or scariest comment I’ve ever received. I haven’t decided yet. Powdery scab sounds like something I want to stay far, far away from, but you fit the sweet potato thing in very smoothly, and I’m jealous. Love the whole bit about a relationship symbolized by a potato. GENIUS! Now I feel like I need to go get a snack.